For me cruising is all about relaxation. It isn’t often enough that I unplug and truly let myself relax and be at ease. 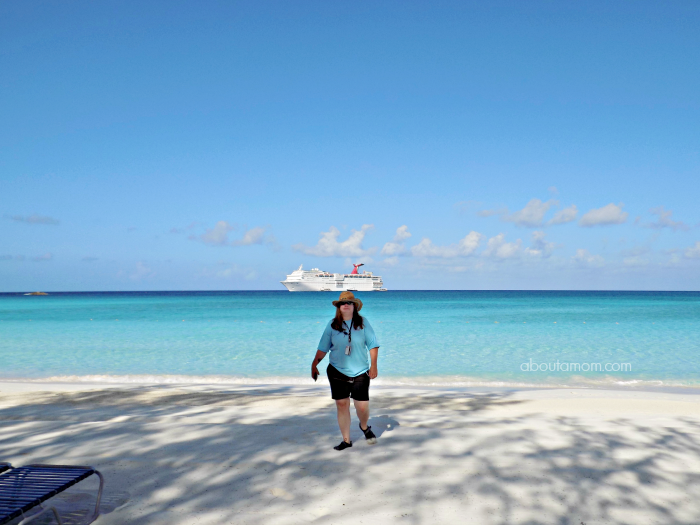 On a recent Carnival cruise I did with my sister, we stopped at Half Moon Cay – the private island in the Bahamas that Carnival and Holland America share. 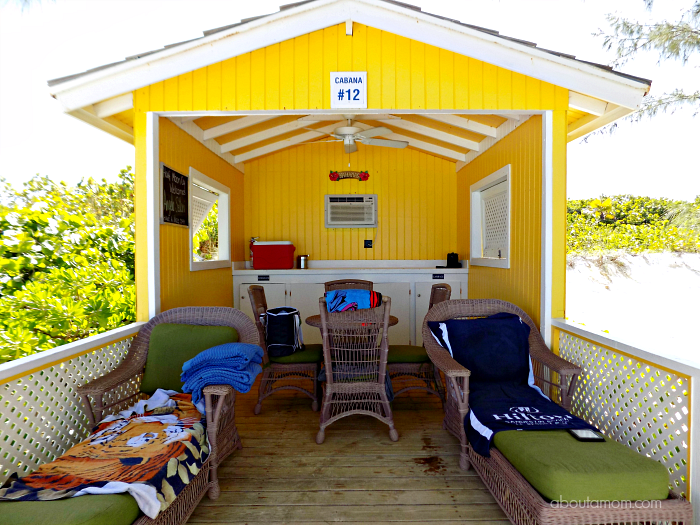 We splurged on a Half Moon Cay Cabana Rental and it was worth every penny. 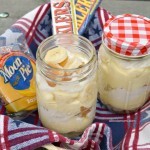 Read on to see why! 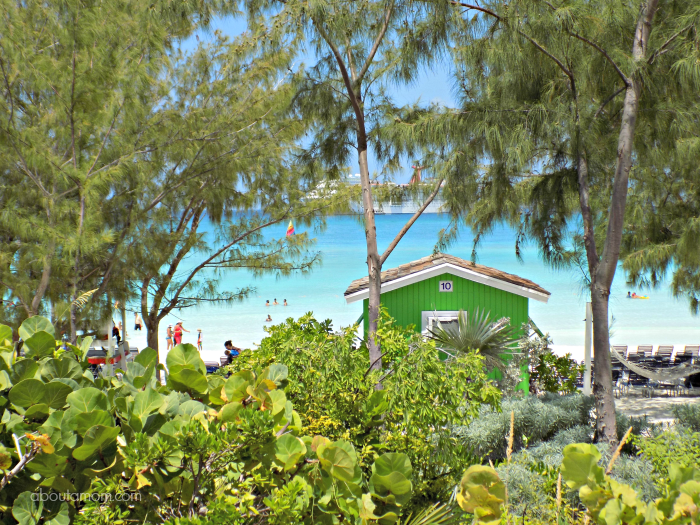 The Half Moon Cay Cabana Rental is considered a Shore Excursion, and must be purchased in advance. Since the number of cabanas on the island is limited to fifteen, I recommend booking this excursion as far in advance of your cruise as possible. No worries though if you can’t snag one. There are still plenty of places to relax and enjoy the island. Half Moon Cay is a beautiful island that looks like a movie set. The pristine white sand and a warm, turquoise ocean are postcard perfect and not something you will soon forget. Amenities: The cabanas are painted in bright, happy colors, and are partially enclosed. It has three walls and is open in the front with a deck. There is a ceiling fan and an air conditioning unit. Yup. 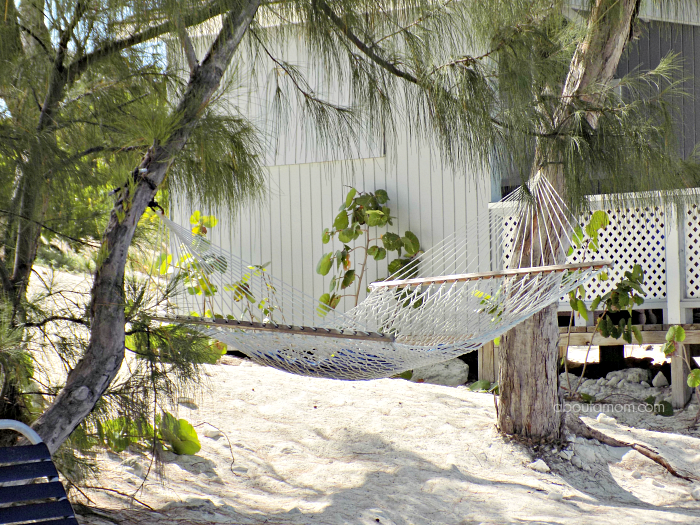 I said air conditioning – one of the main reasons we splurged on the cabana rental. It gets quite warm in the Caribbean and you’ll be thankful for that respite of cold air after a few hours in the sun. A misting fan is also available. Related Articles: Why Cruising is the Best Way to Relax and Things Grandparents and Kids Can Do on a Cruise. 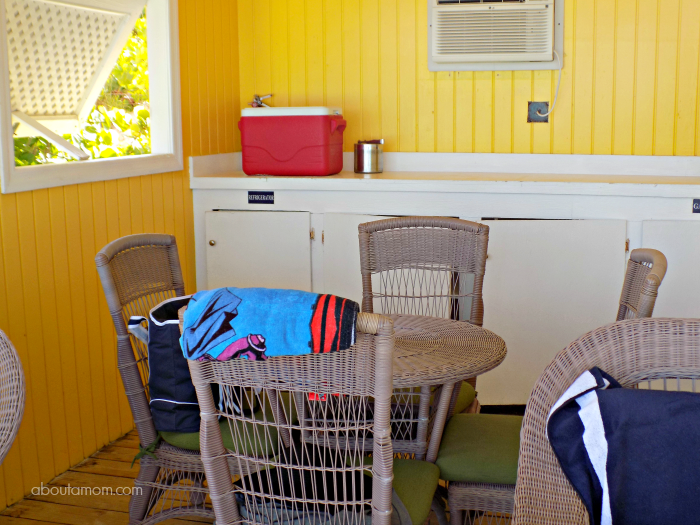 The cabana has a counter area with cabinets below, and a small refrigerator. The cabinet space is useful for storing personal items, but be mindful that there is not a lock on any of the doors. The cabana is furnished with a table and 4 chairs. 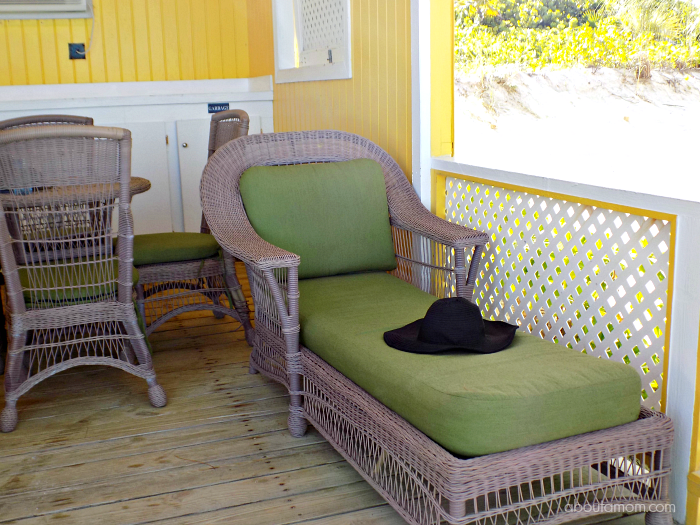 There are also two cushioned lounge chairs on the deck of the cabana. This is where I spent the better part of my day with a book. The cabana is also equipped with a trash can, outdoor shower, snorkel equipment, and floating mats. Next up are the snacks. 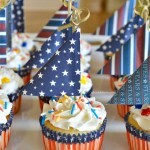 You’ll receive a cooler full of ice along with cups, along with snacks and drinks for 4 people. 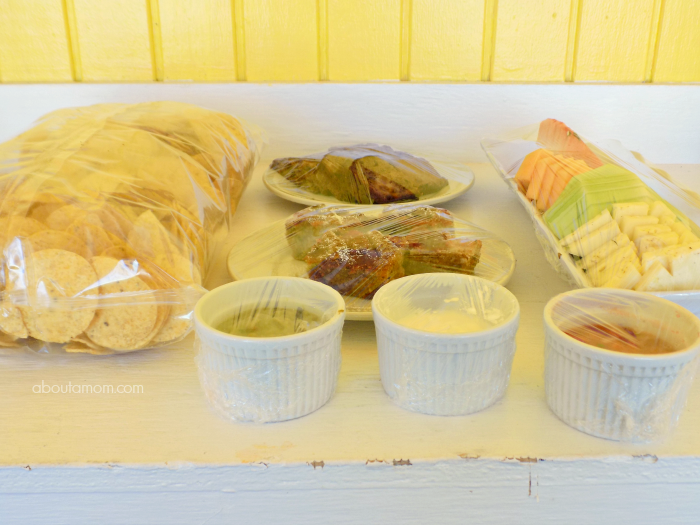 The snacks may vary, but in my experience we received our choice of sodas and bottles of water for 4, tortilla chips, salsa, guacamole, blue cheese dipping sauce, a platter of fresh veggies and a tray of fresh fruit. There was a bit of a mix-up causing our snacks to be delayed, so we were treated to some desserts also. Since it was just my sister and I, the snacks were more than enough to sustain us for the day. We didn’t even bother walking down for the provided lunch. Although not as often as I would have liked, bar service was also available to us for a fee. Booking and Pricing: Like I mentioned earlier, there are only 15 cabanas available for rental so you’ll want to book as early as possible. 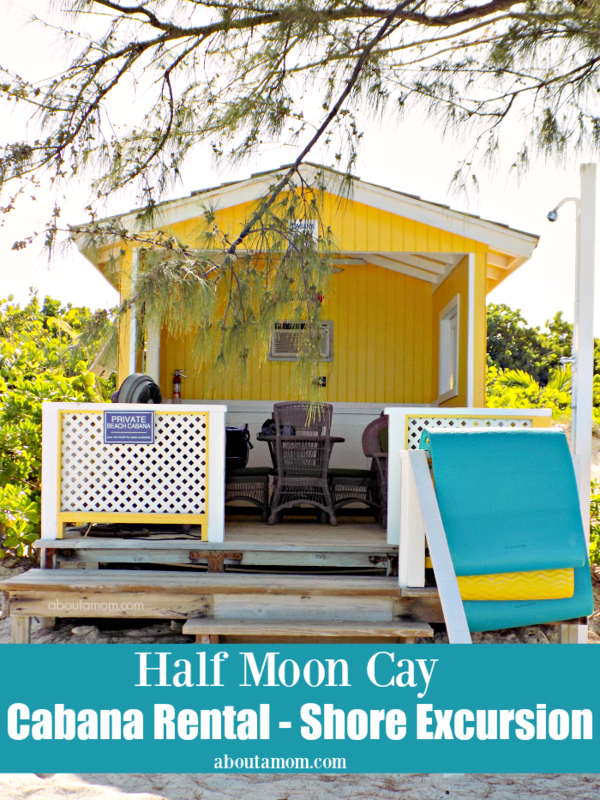 When I booked my shore excursion the Half Moon Cay Cabana Rental was $229. However, I just checked the Carnival website and it is currently $279. I’m not sure if this is a seasonal or across the board increase. Regardless, I would book this excursion again at the current rate. It really pays off if you have 4 people. At the time of booking, you will not be able to select the location of your cabana or any other time prior to your cruise. You’ll have to do this onboard the ship at the Shore Excursion desk. When choosing your cabana location you’ll want to keep in mind whether you want to be close to the facilities, lunch, and the tenders which take you to and from the ship. Cabana 1 is located closest to the action, and Cabana 15 is furthest away. There is a tram available to take you to your cabana, however it is not reliable as a way back. The walk isn’t so bad though. We chose Cabana 12 for the privacy. It was far enough out away from the crowds and still not such a bad walk to the facilities. There was a hammock next to the cabana which was nice. My day was spent reading on the deck and floating in the ocean. So relaxing. My sister, on the other hand, spent the day fishing. While you can’t fish off the ship, you can bring one of those collapsible travel fishing poles stored in a backpack. She spent the day waist high fishing in those crystal blue waters – one of her best fishing experiences to date. 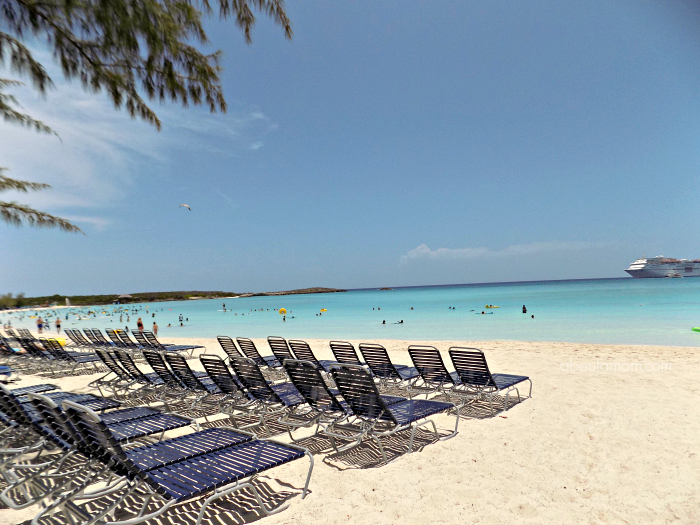 In case you haven’t figured it out yet, I highly recommend the Cabana Rental Shore Excursion the next time you find yourself at Half Moon Cay via a Holland America or Carnival cruise. You might also enjoy Discovering Key West and this Stroll Through Historic Downtown Charleston or That Time I Stayed In a Haunted Hotel. How fun! What a beautiful place, looks so relaxing. What a great rental! This looks like paradise! I’d love to have a relaxing vacation like this! I like that it has an outdoor shower to rinse off after swimming. These cabanas would be great for a family picnic day at the beach. Nice to have a place to sit and be in the shade to nap. I never heard of cabana rental before, but I love this. And I’d pick one a little bit better for some privacy. Wow! So nice! What a beautiful place to visit and the rental is awesome. I have never been to a warm, sandy beach on the ocean before. That is gorgeous! I could totally get into that! Wow this seems like a great vacation spot! The air conditioning is a huge bonus! So beautiful! That is definitely the cadillac of cabanas! I would never want to leave. This looks like a great resort, amazing. I called Carnival and they said that you do cabana rentals at the excursion desk. Is this true? Yes, it is considered an excursion. You can reserve at the excursion desk or online where you book all of the other excursions. This looks like a great vacation spot. This look like such a fun vacation spot to take the family! I want to do this on vacation next time! OK, I have to admit that this looks like something out of a dream! I’d love to spend a day or two or three there. It has it all and the air conditioner is an added bonus. So cool! This sounds like an awesome vacation.